The idea for the Youth Program was developed by TRCA, Native Canadian Centre of Toronto, University of Toronto, and with support from Ryerson University. The Program will explore a participatory model for practice that includes the voices of Indigenous Youth and Elders/Traditional Knowledge Keepers (TKK) in planning and designing for green infrastructure. This initiative is motivated by the need to address a lack of Indigenous people in green infrastructure work; integrate Indigenous themes of respect, relationship, reciprocity, responsibility into planning and design; and, address a growing intergenerational gap on traditional environmental knowledge. The new 2018 summer internship program will connect Indigenous youth with Elders/TKK on the land while they learn new ideas and skills in an engaging way (with visiting mentors) and to encourage them to consider career opportunities in green infrastructure. A documentary filmmaker (preferable Indigenous) will be hired to teach the youth about film making and as a storytelling exercise about the experience. The youth and Elders/TKK will also be invited to drop in to participate in winter term graduate courses on green infrastructure being taught at the University of Toronto and Ryerson University, with visits to project sites to look for opportunities for green infrastructure, Indigenous place-making, and interpretive walking tours to celebrate natural and cultural history. For many years, GREENLAND® has financially supported (and participated in) environmental stewardship and education partnerships with Canada’s First Nations and Métis Nations. This includes the BEAHR (ECO Canada) Aboriginal Training Program and curriculum programs offered by the Anishinabek Educational Institute. In December, GREENLAND® and the Town of Collingwood (Canada) were notified by the Federation of Canadian Municipalities (FCM) that a $350,000 grant was approved from the Green Municipal Fund for the “Collingwood SMART Stormwater Pilot Project”. The 3 year project began in September with a total project value of over $900,000. It is the first-ever partnership involving web-based flood resiliency products for businesses and homeowners with proven Low Impact Development (LID) practices. GREENLAND® will serve as the lead consultant. This project profile includes more information on the project and the project team members. This slide deck was presented at the first Public Information Centre held in November 2017. Initial assistance with media communications was also provided (with appreciation) by WaterTAP and Water Canada. More announcements will be available next year (2018). In December, GREENLAND® and the City of Waterloo (Canada) were notified by the Federation of Canadian Municipalities (FCM) that a $350,000 grant was approved from the Green Municipal Fund for the “Pond 53 Stormwater Management Pilot”. The project began earlier this year with a total project value of $1,385,500. It is the first-ever partnership using the Clearflow Group product line to assist in retrofitting a municipal stormwater management facility with an integrated cumulative effects modeling (CANWET™) and life cycle/asset management design approach. This project profile includes more information and future announcements will be available next year (2018). In December, GREENLAND® was invited by WCI Technologies to provide technical support and best Canadian consulting practices for a large municipality in Poland. The stormwater management and combined sewer - wastewater treatment and monitoring master plan project will include customizing proprietary Internet river system platforms, CANWET™ and ISWMS™, and also involving a renowned team affiliated with Lund University. Future announcements will be available next year (2018). The GREENLAND® Group is retained by Developer Groups to provide land development engineering design and construction management services for new site plans and subdivisions in Ontario. The projects also include in-house landscape architecture and urban design expertise too. Project announcements will be available later on. Since 2015, GREENLAND® has been retained by Environment and Climate Change Canada (ECCC) for a few related assignments addressing the reduction of nutrients from Canadian sources to Lake Erie. The initial project established viable policy options. Subsequent evaluations examined the effectiveness of options on the basis of achieving nutrient load reduction targets; sustainable cost effectiveness; potential impacts to the economy; social acceptance; and, efficiency of implementation. Subsequent contracts then considered what initiatives were in place and recommended how gaps might be filled. A unique modelling approach was used with the “CANadian Watershed Evaluation Tool” (“CANWET™”) for better understanding of the origin and timing of phosphorus loads reaching Lake St. Clair and draining from the Thames River Basin. In December 2017, GREENLAND® was invited by ECCC for another study so that CANWET™ and additional proprietary tool (THREATS™) could be used (in conjunction with other Canadian initiatives) and concurrent web-based software phases involving the University of Waterloo and University of Guelph. This project profile outlines work that has been completed to-date for ECCC (since 2015). Identify cost recovery models where revenue generation sources can be used for long-term maintenance activities and curriculum program needs. Options to be examined (but not limited) will include: 1) Use of on-site stormwater storage (reclamation) for watering vegetated areas; 2) GHG reduction credits to be compensated via the Province’s climate change related program; 3) Nutrient (phosphorus) reduction credits if a proposed trading (or offsetting) program is implemented for the affected watersheds; and 4) “Pay for performance partnerships” involving downstream landowner(s) where the participating School Board could be compensated annually to reduce (or eliminate) a current chronic (nuisance) flooding problem and additional risks from climate change. Further details will be available next year (2018). In November, GREENLAND® partners with GSS Engineering Consultants Ltd. to provide dam evaluation and removal engineering services for projects in Ontario and being funded by municipalities and recreational fishing organizations. In December, the team was retained for its first project affecting the Truax Dam in Walkerton (Canada). GREENLAND® will provide as-required technical support and use of its proprietary Internet river system platforms, THREATS™ and ISWMS™, for all opportunities. In September, following a proposal and security clearance process, GREENLAND® was selected by Infrastructure Ontario to serve as a Vendor of Record for civil engineering design and prime consultant services for large-scale contracts. Future announcements will be available next year (2018). In October, GREENLAND® and research team at the University of Guelph, Canada, under the direction of Dr. Prasad Daggupati, are awarded a grant to further develop the CANWET™ (v.4) decision support system with a Lake Erie Basin platform focus. Funding will be provided by the SOSCIP – Smart Computing for Innovation program to help advance CANWET™ with high performance parallel computing functionality. When completed by end of 2018, this next evolution of CANWET™ will enable the tool to run with unlimited Big Data processing capabilities and with new science-based algorithms from Dr. Daggupati’s team. Since 2005, and initially supervised by Dr. Ramesh Rudra, many researchers affiliated with this award-winning university have assisted GREENLAND® in the development of past versions of CANWET™. Background about the SOSCIP funding program can be found at www.soscip.org. Jim Hartman, P. Eng., Director / Senior Engineer of the GREENLAND® Group, is selected to receive the 2017 University of Guelph – School of Engineering “Mid-Career Award”. The Mid-Career Award recognizes an alumnus who graduated 10 to 25 years ago from the University of Guelph’s School of Engineering. This prestigious award is also presented to an individual who has earned respect within the engineering profession and in the broader community, already attained significant achievements and gives promise to future contributions. The award event will be held later in November at the University of Guelph. Heating, ventilation and air conditioning, fuel and electrical systems should be well-elevated from the basement floor or located above grade. “Ensuring that new communities are built under the direction of these practices is necessary to combat ever-worsening extreme weather that, if not addressed, will result in costly and unremitting flood damage,” states the report. “These best practices constitute elements of residential community design and construction that, if implemented together, should achieve significant flood risk reduction,” the report adds. In partnership with the Grey Sauble Conservation Authority, Town of The Blue Mountains and County of Grey, GREENLAND® is invited to provide technical support services for a regional-wide Flood Risk Assessment partnership. The project would begin in early 2018 and includes mapping the entire watershed using LiDAR. As a value-added / in-kind contribution, GREENLAND® will provide its latest Internet-based “ISWMS™” platform now under development and involving teams from Canada, U.S., Europe and Japan. The tool would be used for further testing/validating the tool’s real-time flood forecasting capabilities and preparing floodplain mapping. Updates about the ISWMS™” platform will be announced at later dates. In September, GREENLAND® and affiliate, PLANbyDESIGN, are awarded a contract to design the Whitson River Trail within the City of Greater Sudbury, Canada. The project team will undertake a review of all relevant background documentation to completely understand the natural, built and social environment of the region and local project area. Based on input from the City, Authorities and Stakeholders, a trail design will be developed which meets the needs of the municipality and surrounding community and generates excitement, interest and desire to invest, live, work and play in the area. The trail design will be undertaken to comply with all applicable policies, standards, guidelines and environmental legislation and regulations. In September, GREENLAND® completed (and within a year) the next evolution of “The Healthy River Ecosystem AssessmenT System” (aka THREATS™). The development of this Internet open data and open source GIS platform was inspired from earlier research funded by the Canadian Water Network and prototype development team led by Dr. Monique Dubé. Thereafter, GREENLAND® secured source code rights and began developing the new platform last year. The platform includes a cumulative effects assessment focus and can be used to also develop related policies and management frameworks. THREATS™ can also serve as a cost-effective tool for watershed and land use planning and assist researchers at colleges and universities. THREATS™ can be customized to include other real-time databases and specific client needs of Indigenous communities, government agencies and resource industries. Further development phases will be initiated soon for export (global market) opportunities and linking western-science with Indigenous knowledge to assess cumulative effects. A platform overview is available, as well as an introductory video. The video introduces just a few (of MANY possible!) applications that can access real-time and open data, as well as an extensive Canada-wide library of climate and watershed databases with science-based modeling functions. GREENLAND® also sincerely thanks the Government of Canada and the National Research Council of Canada Industrial Research Assistance Program (NRC - IRAP) for support in developing this version of THREATS™. For more information about THREATS™ or to schedule a live (web) demonstration, please contact Greenland.THREATS@grnland.com. In August, GREENLAND® and Town of Collingwood (Canada) confirmed a government grant to undertake the first-ever partnership involving Internet-based flood resiliency products for businesses and homeowners and with proven Low Impact Development (LID) practices. GREENLAND® will serve as the lead consultant. A formal announcement will be made in November 2017. In June, GREENLAND® met in Edmonton, Alberta with officials and staff from the Metis Nation of Alberta (MNA) to discuss the THREATS™ decision support system and how it can be used to analyze a broad spectrum of watershed management tiers, triggers and thresholds of interest to Indigenous Peoples throughout Canada. THREATS™ stands for the “The Healthy River Ecosystem AssessmenT System” and completion (by GREENLAND®) is scheduled for September 2017. Later in July, GREENLAND® was retained by the MNA to assist the management team with developing a Cumulative Effects Management policy, framework and strategic implementation plan specific to the interests, needs and vision of the MNA and its membership. This landmark initiative initially includes meeting focus groups throughout the Province and GREENLAND® providing technical expertise about cumulative effects and sustainable watershed protection practices that also have regard for climate change concerns. It was also proposed that future project phases will include implementing the THREATS™ platform and customizing it for specific program needs of the Metis Nation of Alberta. In July, the Intact Centre on Climate Adaptation (ICCA) at the University of Waterloo (Canada) released a timely report titled: “When the Big Storms Hit – The Role of Wetlands to Limit Urban and Rural Flood Damage”. GREENLAND® was retained earlier by the ICCA team for technical peer review services. The project calculated the monetary value of natural wetlands to effect flood risk mitigation within proximity of urban development. The project also determined wetland flood attenuation economic benefits from the standpoint of flood damages avoided within Ontario river basin (pilot) sites. To view the ICCA report, click here. During the summer, GREENLAND® was retained by public and private sector clients to provide expertise in assimilative capacity, watershed modeling and municipal environmental assessment projects involving new or aging wastewater treatment systems. In August, for example, staff was instrumental to resolve issues affecting residents in Northern Ontario. View the recent article about this project here. In the fall 2015, and in partnership with the Nottawasaga Valley Conservation Authority (NVCA) and County of Simcoe, GREENLAND® was awarded funding from Environment Canada to develop a “Nottawasaga River Basin Phosphorus Management Tool”. The project was completed on-time and on-budget in March 2017. Public access availability to the Internet platform that uses the CANWET™ decision support system was then approved thereafter by all funding partners. This Internet-GIS tool will now enable the NVCA and member municipalities to understand the various sources of phosphorus in the 3,150 km² watershed and potential impacts from regional climate change factors. The calibrated model for baseline (existing development) conditions can be updated by GREENLAND® for other projects in order to evaluate the cumulative impacts of new phosphorus point sources and to help determine strategies for minimizing nutrient loads, such as targeting stewardship activities, and which will protect the Nottawasaga River and Georgian Bay (Great Lakes Basin). Click here to view a project video. For more information about licensing access to the platform or interest to develop the model for other stakeholder needs, please contact the NVCA at 705.424.1479 (Attention: Mr. Hendrik Amo, Manager GIS/IT, ext. 241) or our head office at 705.444.8805. "Aqua Hacking 2017 Challenge - United for Lake Erie" is well underway now with a GREENLAND® team. An impressive roster of competitors too. The first visioning session in May 2017 produced a number of white boards for our team. This is the first of many. Our team is now into the programming weeds and with an impressive tool coming soon. Go GREENLAND® Team! GREENLAND® is selected as a finalist for the 2017 Canadian Water Summit awards event to be held on June 22nd in Toronto. The “Water’s Next Awards” program is hosted by Water Canada Magazine and is the only national awards program to honour leadership across the entire water sector—including public servants, non-governmental groups, researchers, municipalities, and technology providers. Since 2010, Water Canada has hosted the awards to help strengthen and celebrate the thriving national community by showcasing Canada’s water leaders, champions, and innovators. For more information, please click here. In May 2017, the County of Simcoe (Canada) and GREENLAND® were notified by Public Safety Canada that their proposal was successful to be funded from Intake #3 of the National Disaster Mitigation Program (NDMP). Last year, County Council approved to equally match funds received from the Government of Canada. The project will develop an Enhanced Flood Risk Emergency Preparedness Plan by spring of 2018. This includes GREENLAND® developing a flood forecast warning system that has regard for changing climate conditions in jurisdictions that have considerable snow melt response in early spring. This system will specifically map drainage areas to key road bridges and culverts at risk. Rating curves will be developed for each structure and the contributing watershed flow response will be calibrated with snow melt flood events from past records using other niche tools. The historical flood response from snow melt events will be correlated with actual weather conditions and return frequency applied. The calibrated system will be able to download real-time weather data and correlate the potential flood response and report the crossings at risk to the County Emergency Operations Centre through a GIS platform. The Internet tool will be tested on key watersheds with the intent to implement it County-wide in the future. When completed, the system will be transferable to any other region of Canada too. ​BACKGROUND: In recognition of increasing disaster risks and costs, Canada’s 2014 budget earmarked $200 million over five years to establish the NDMP as part of the Federal Government's commitment to build safer and more resilient communities. The NDMP will address rising flood risks and costs, and build the foundation for informed mitigation investments that could reduce, or even negate, the effects of flood events. The NDMP fills a critical gap in Canada's ability to effectively mitigate, prepare for, respond to, and recover from, flood-related events by building a body of knowledge on flood risks in Canada, and investing in foundational flood mitigation activities. Knowledge that is up-to-date and accessible will not only help governments, communities and individuals to understand flood risks and employ effective mitigation strategies to reduce the impacts of flooding, but will also further discussions on developing a residential flood insurance market in Canada. In May 2017, the Cortel Group, in association with GREENLAND®, was invited by the Intact Centre on Climate Adaptation (ICCA) at the University of Waterloo (Canada) to nationally showcase the Belle Aire Shores Community under development in Innisfil (Canada). The infrastructure design plan by GREENLAND® will be independently assessed to confirm that it complies with the ICCA document titled: “Flood-Resilient Community Design: Developing a National Standard for New Residential Subdivisions in Canada” to be published in July. The ICCA will also be consulted during other development and major servicing infrastructure design phases (also by GREENLAND®). These phases will be initiated this year. In May 2017, GREENLAND® and environmental planning specialists at Skelton Brumwell & Associates Inc were retained by the Province of Ontario to prepare a Watershed Guidance Planning Document. Team members from GREENLAND® will be responsible for project deliverables related to: 1) Water Budgets, Water Conservation Planning and Treated Wastewater Re-use Opportunities; 2) Watershed Nutrient Loading Mitigation and Integration with Wastewater Infrastructure Systems; 3) Climate Change Vulnerability; 4) Environmental Monitoring; and, 5) Performance Management Frameworks. In April 2016, GREENLAND® received funding from Canada’s National Research Council (NRC) – IRAP program to further develop THREATS™. For background information, click here. A year later, a new and expanded Internet-GIS version was completed by GREENLAND® to help manage environmental databases and assess cumulative watershed effects. The new platform can also provide data to those analyses and store critical asset management with real-time climate, water quantity and quality data. Pilot (test) areas included the Provinces of Ontario and Alberta, as well as the Northwest Territories. Other customization phases for public and private sector clients are now underway and will be integrated with other GREENLAND® decision support systems. A recent presentation is attached about the development status of all GREENLAND® web-based tools, including THREATS™. For more information about the company’s expertise in the areas of cumulative watershed effects and water resources engineering, respectively, please contact Dr. Monique Dubé (mdube@grnland.com) and Trevor Boston (tboston@grnland.com). Recreational trails are a great economic driver as many users will purchase goods and use services in the communities where they are located. Trails can even increase home values. People using trails means money is being spent in local restaurants, accommodations, and on retail purchases. Trails also have the ability to strengthen the local social fabric of the community. They tend to create a continuity of volunteers and opportunities for friendships, networking and exploration too. A comprehensive and linked trails network will ensure the area continues to grows in popularity. Following a competitive process, PLANbyDESIGN was retained in April 2017 by the County of Grey (Canada) to prepare a Recreational Trails Master Plan. GREENLAND® specialists will provide landscape architecture, CAD design and GIS services. Using an inclusive planning and consultation process, the PLANbyDESIGN team will identify existing trails, new trail linkages, staging areas, trail loops, permitted uses, compatibility with other trails and connectivity to surrounding trails and adjacent municipal neighbours. Our team will identify the trail activities permitted within forests and current trails, what improvements are required, and what facilities are needed to support permitted uses and activities. The project will be completed in October 2017. In April 2017, the Six Nations of the Grand River First Nation and Mississaugas of the New Credit First Nation were notified that all funding applications to the Federal Government and Province of Ontario were approved and related to flood mitigation projects, including floodplain mapping, road crossing replacements and other structural works. Stragis Environmental and GREENLAND® were invited last year to assist with preparing all applications and which included proprietary GREENLAND® modeling tools (used the year before) for the initial master drainage planning phase. The latest funded projects will commence in June 2017 and construction activities will be initiated as soon as possible. Following a competitive process, PLANbyDESIGN was retained in April 2017 by Georgian College (Canada) to provide urban planning, landscape architecture design and related construction management services for the expansion of the City of Orillia campus. GREENLAND® specialists will provide landscape architecture, CAD design and contract administration support services. Construction is scheduled for July 2017. The Intact Centre on Climate Adaptation (ICCA) at the University of Waterloo (Canada) is leading a project to calculate the monetary value of natural wetlands to effect flood risk mitigation within proximity of urban development. The project will determine wetland flood attenuation economic benefits from the standpoint of flood damages avoided within Ontario river basin (pilot) sites. GREENLAND® was retained by the University of Waterloo to assist with determining annual flood damages at municipal infrastructure assets (e.g., roads, sidewalks, bridges, culverts) for multiple mid-summer return period events and wetland modeling scenarios. The hydrologic and hydraulic (2-dimensional) modeling approach includes baseline (existing) watershed conditions and loss of wetland scenarios. Cumulative effects assessment and river basin management requires several key components: 1) integrated monitoring to measure environmental changes due to a resource or land development; 2) modeling to predict future environmental changes from different development scenarios; 3) policy, land use planning and watershed planning to establish the vision for the landscape; and, 4) a regulatory system to respond to monitoring results and ensure development is progressing along the planned trajectory and correcting the course, if necessary, through regulatory drivers. Significant progress has been made in Canada on modelling, policy, planning and development of regulatory systems. However, development of integrated monitoring tools (with wireless / internet capabilities) to support these components has not progressed to the same level. It is a significant limitation to tracking and assessing environmental change due to development activity and adaptive management. Cumulative effects management recognizes the sum of impacts from all landscape changes and actions. In January 2017, GREENLAND® presented to Alberta-based resource industries and environmental stakeholder groups a new Internet version of the ‘THREATS’ Decision Support System. Additional consultations are now underway with First Nation communities. Feedback to-date about this real-time data access and integrated GIS analytics platform has been positive. Other announcements will be provided once the platform is completed this summer. In February, PLAN by DESIGN initiated a strategic alliance with GREENLAND® . PLAN by DESIGN was established to provide comprehensive consulting services in Urban Land Planning and Landscape Architecture. The company is licensed by the Canadian Institute of Planning and Ontario Association of Landscape Architects and provides urban design, landscape, architecture, site planning, land use planning, and site development services to private and public sector clients. PLAN by DESIGN is committed to providing excellence in community design and implementing appropriate solutions for complex land development problems. Supported by GREENLAND® , PLAN by DESIGN will continue to create “distinctive places and beautiful spaces.” Joint venture projects with GREENLAND® team members will include streets, waterfronts, parks, trails, urban spaces and natural systems. After a competitive process, GREENLAND® is retained by the Town of The Blue Mountains (Canada) to prepare a Master Drainage and Wastewater Servicing Plan for the Price’s Subdivision. An article about the project’s importance can be seen HERE . Watershed modeling is widely used to better understand processes and help inform planning and watershed management decisions. Example uses include identifying impacts associated with land use change; investigating outcomes of infrastructure development; evaluation of policy options; predicting effects of climate change. In March, GREENLAND® and a research team at the University of Guelph (Canada) submitted a proposal under the SOSCIP Talent-Edge Program. An initial prototype will be completed by the summer 2018 and see the evolution of the desktop based watershed modeling and decision support system version of CANWET™ with new science-based features and into a web based platform that will allow greater access by decision makers and stakeholders. When completed, the platform will advance the idea of evaluating cumulative effects in the watershed decision making process (at any watershed scale) rather than the current practice of assessing proposed changes in isolation. The proposed software evolution will also take advantage of high performance computing resources offered through a partnership with IBM Canada and by porting current source code assets to a higher performing language and restructuring to operate using parallel or multi-core processing. When completed, CANWET™ will enable GREENLAND® to continue providing niche consulting services and project scaling potential with second-to-none “Big Data” analytics capabilities. 4. Review and assess any relevant legislation from the Province of Ontario and local municipalities which would impact the proposed solution. In July 2016, GREENLAND® received funding approval from Canada’s National Research Council (NRC) – IRAP program to further develop ISWMS™. This includes an open data, internet and GIS-based decision support system (originally called ‘FLOODVIEW’) for real-time flood control management. The 2-year project is being co-funded by similar national grants from Sweden and France. For a week in January 2017, GREENLAND® team members met at Lund University (Sweden) with all other European partners. The platform architecture was finalized and priority milestones were confirmed, including the completion of the initial prototype (for use in Canada) by January 2018. Further announcements about the project will be made later this year. GREENLAND® and Clearflow Group (Canada) renew a joint venture agreement. A similar agreement with another niche technology provider was renewed concurrently and to also participate in the GREENLAND® - Clearflow design-build partnership. The project team will focus on municipally-owned/operated stormwater management facilities, as well as transportation corridor (highway and rail) and resource (mining and pipeline development) projects that require sediment runoff control during construction activities and the implementation of other cost-effective surface water treatment systems. To-date, projects have been secured with the City of Waterloo (Canada) and City of Markham (Canada). Other similar opportunities have been identified and consultations are underway. Further announcements will be made soon. 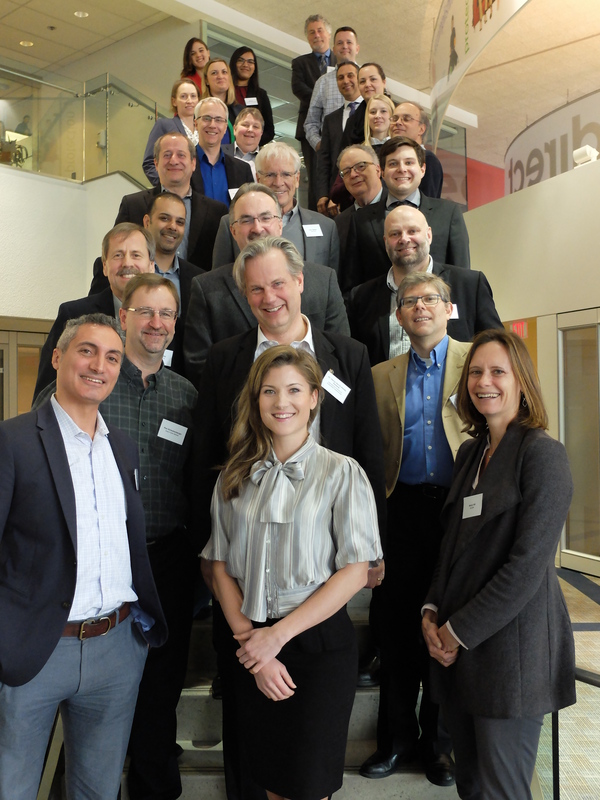 In March, GREENLAND® participated in a national stakeholder group led by the Intact Centre on Climate Adaptation (ICCA) at the University of Waterloo (Canada). The project title is “Flood-Resilient Community Design: Developing a National Standard for New Residential Subdivisions in Canada”. GREENLAND® has supported this important initiative from the outset. An outcome from the latest workshop was a cooperative announcement between the ICCA and the Standards Council of Canada. Click HERE for more information. From May 3 – 5th, GREENLAND® will sponsor the 64th Annual OSUM (Ontario Small Urban Municipalities) Conference to be held at the Blue Mountain Resort in the Town of The Blue Mountains (Canada). The conference theme this year is “Rural Meets Urban”, recognizing the challenge many face as areas become increasingly urbanized through growth and the migration of people from larger cities to rural municipalities. Whether it is coping with increasing development pressures, managing the expectations of our more urban residents or handling the challenge of new homes being built near working farms, we all face this pressure in some form. While those of us in the middle of this type of “urbanization” have one set of issues, many other communities are looking to attract new residents and business from the urban core. For them, the challenge is attracting urban attention and selling the many benefits of living in a more rural setting. In addition to an evening address to conference delegates, GREENLAND® will profile its unique corporate brand that includes “Smart’ (Internet-of-Things) joint ventures involving proprietary water systems/products that can also protect homeowner properties too.